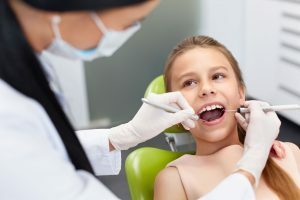 Pediatric dentistry is a branch of dentistry in which dental issues of children are dealt from birth through adolescence. From regular check-up to tooth extraction of children, everything comes in this branch. Pediatric dentists play a crucial role in this field as they treat children. Hence, they need to be a bit more conscious of their work. The responsibility of pediatric dentists is to be the source of awareness for the dental health of children. Consult with Child Specialist Dr. Mansi Patel in her Dental Hospital Ahmedabad. The American Academy of Pediatric Dentistry (AAPD) recommends that every child after the six months of their first tooth, they should visit the dental clinic as it helped a lot in detecting the early stages of tooth decay. As children get more attracted towards junk food and chocolates, there are more chances of having oral and dental diseases that need to be resolved quickly else it can ruin the whole natural teeth set of children. Professional pediatric dentists should be given a complete check-up routine and oral health chart to parents and also host occasional seminars at schools and academies for the awareness o oral hygiene so that children may learn about the dental hygiene and be aware of dental diseases. Besides this, they should be counselled by pediatric surgeons about what they should eat and what to avoid in order keeping their teeth healthy and bright, by preventing severe oral diseases. Talking about the responsibilities of a pediatric dentist, it includes. If you are looking for the best dental care centre where your children’s teeth can be treated in the best manner by professional pediatric surgeons, then you must visit Dr. Mansi’s dental care centre located at Ahmadabad, Gujarat. The centre serves at its best for both children as well as adults for all dental issues. The centre has skilled dental specialists who know very well that oral health plays an important role in a child’s development. Here you will have the state of the art dental care, occasional seminars for children to learn the importance of dental hygiene and above all, you will find a healthy and supporting environment when you visit for treatment. Your child will be treated by professionals who have a fine experience of work and ethics in the respective fields and can perform major treatments without any inconvenience and that too in a reasonable cost. So, if your child is suffering from any kind of oral disease or wants to have a routine check-up for your children, do visit Dr. Mansi’s dental center. Best Dental Hospital in ahmedabad Gujrat for Child dental treatment. Call 9925046552 for best dental treatment.